Are you pregnant? Pregnant women should consult with doctor before using the sauna, because fetal damage may occur with certain elevated body temperatures. Are you taking medications? * This field is required Individuals who are using prescription drugs should seek advice of their personal physician or pharmacist for possible changes in the drugs effect when the body is exposed to far infrared waves or elevated body temperature. Diuretics, barbiturates, and beta-blockers may impart the body's natural heat loss mechanisms. Some over the counter medications such as antihistamines may also cause the body to be more prone to heat stroke. Do you have Diabetes with Neuropathy, Parkinson's, MS, or Lupus? These conditions (as well as CNS tumors) are often associated with impaired sweating. Do you have unstable Angina? Individuals with cardiovascular conditions or problems, congestive heart failure, impaired coronary circulation, or those who take medications which impact blood pressure, should exercise extreme caution when exposed to extreme prolonged heat. Major changes in the heart rate have the potential to increase by 30 beats per minute for each degree of core body temperature. Have you had a recent heart attack? Do you have any implants? Metal implants will not be heated by this sauna. However, if you have any silicone implants, do know that silicone will absorb far infrared energy. Thus will get warmed and can melt at over 200 degrees celsius, technically it should not be adversely affected by this sauna, but it is wise to double check the melting point for your specific implant. Do you have any recent joint injury? If you have a recent ACUTE joint injury, it should NOT be heated for the first 48 hours after injury or at the very least till the swelling starts to go down. If you have joint(s) that are chronically hot and swollen, these joints may respond poorly to vigorous heating of any kind. This kind of heating is STRICTLY contraindicated in cases of enclosed infections be they dental, in joints, or in any other tissues. Are you 18 yrs or older? * This field is required Children's core temperature can rise quicker than adults. Anyone under 18 must be accompanied with an adult who is responsible for their health decisions. Heating of the low back area of women during the menstrual period may temporarily increase their menstrual flow. Some women endure this process to gain the pain relief commonly associated with their cycle whereas others simply choose to avoid sauna use during that time of the month. Contrary to popular belief, it is not advisable to attempt to “Sweat Out” a hangover. Alcohol intoxication decreases a person’s judgment; therefore they may not realize it when the body has a negative reaction to high heat. Alcohol also increases the heart rate, which may be further increased by heat stress. The use of Infrared should be avoided by anyone who is predisposed to bleeding. An individual that has a fever should not use the sauna. The magnets used to assemble our units can interrupt the pacing and inhibit the output of pacemakers. Please discuss with your doctor the possible risks this may cause. It is always important to maintain proper hydration levels during Far-infrared therapy. Dehydration will actually increase carbohydrate utilization and cause less fat to be burned for energy. We recommend drinking a minimum of 8 oz. water prior to entering the sauna and a minimum 8 oz. of water after sauna use. Also be aware that you may require more minerals to be added back into your body with continued use of the sauna due to sweating. In the event that any dizziness, light-headedness, pain or discomfort is experienced, immediately discontinue sauna use. The use of drugs, medication or alcohol prior to or during the sauna session may lead to dizziness or unconsciousness. Please consult your physician if you are in doubt of your ability to use the Far-infrared Sauna for health reasons. Please discontinue the use of the sauna if you feel light-headed, dizzy or heat exhausted. Sauna sessions should be limited to a maximum of 40 minutes and temperatures must stay below 150 ̊ F.
It is advisable to drink plenty of water before and after sauna session. Water bottles are not permitted in the sauna. It is advised not to eat at least one to two hours prior to your sauna session to avoid any ill feelings. Clients using any medications must consult a physician or pharmacist prior to the use of the sauna. I have read and understand the contraindications for use of infrared sauna and acknowledge that none apply to me. 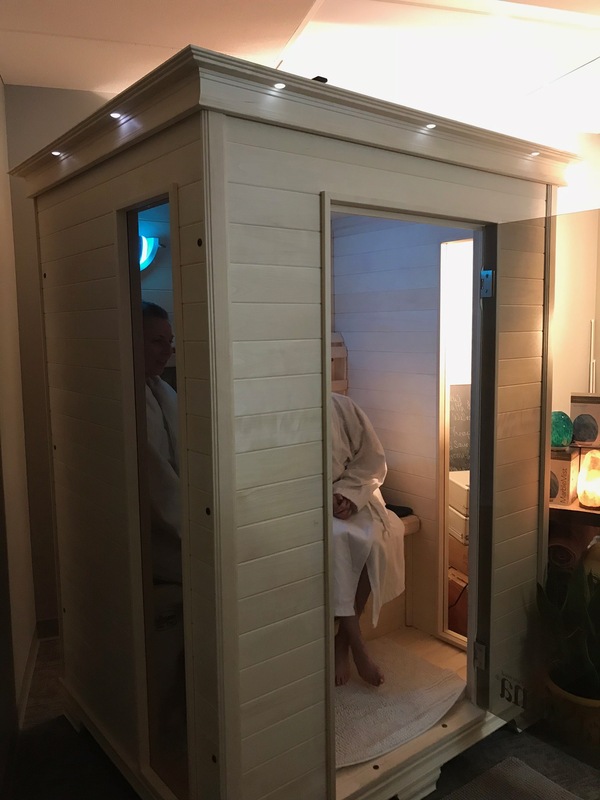 I agree to results of the benefits the sauna has had to be shared with the public, by using just first name and issues that were aided from sauna use and duration. I acknowledge and accept the risks inherent in the use of the Therasauna sauna. I voluntarily assume the risk of injury, accident, or death which may arise from the use of the Therasauna sauna. I and any of my heirs, executors, representatives, or assigns hereby release from all claims or liabilities for personal injury or property damages of any kind sustained while on the premises, during the use of the Therasauna sauna and from any advice provided by an employee, independent contractor or any representative. I further understand that Harborview Health & Wellness, or any of its Tenants that operate the Far Infrared Sauna are NOT A Medical Doctor and is NOT attempting to portray, or conduct the activities of a Medical Doctor and I release them (her/him), the Facility and Manufacturer from any adverse effects I may incur by the use of the Therasauna sauna. Harborview Health & Wellness does not provide medical advice or treatment. Far-infrared Sauna use may or may not be appropriate for you. Please consult your health care provider for medical advice. The information provided is for general information purposes only and does not address individual circumstances or medical conditions. Do not attempt to self-treat any disease with a Far- infrared Sauna. Your Name/E-Signature* This field is required By typing your name below you are stating that, I have carefully read the above safety instructions for using a Therasauna sauna. I fully understand them and fully agree to comply with instructions. This agreement is in effect for all Therasauna sauna sessions/treatments and will not expire unless requested by either party.